Sta-Set is a low-stretch polyester double braid and is our favorite all-purpose line. Due to its low-stretch, the rope is ideal for all applications requiring control and can be used as a positioning rope, lifting rope or lowering rope. Durable, attractive and flexible; Sta-Set is a versatile workhorse. Sta-Set is a polyester double braid that offers very low elongation. Therefore this durable line is ideally suited for applications requiring precise control and minimal movement. Sta-Set can be perfectly used for positioning, lifting or lowering. The double braid construction adds flexibility and good knotability to the rope. Thanks to its polyester core and cover, Sta-Set maintains its strength even when wet. This rope was designed to work in very static applications such as hauling as well as for the use in capstan winches. 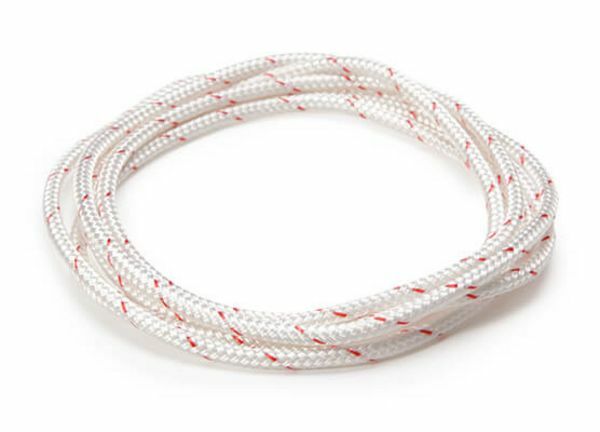 Polyester double braid ropes are designed to have the splicabilty of traditional 3-strand and hollow braid ropes yet maintain the safety factor provided by the sheath of kernmantle ropes. As the #1 double braid in America, Sta-Set is a high strength, flexible, and long wearing line. It is low stretch, and extremely durable, yet it remains soft over time. Sta-Set is both easy to handle and splice. It is a staple in the sailing, powerboating, arborist, window cleaning and industrial rope world and its features also make it perfect for challenge courses, rafting and many other recreational activities. Superior strength, especially compared with its weight. Maintains strength when wet due to its polyester construction. Made in the USA! Sta-set is proudly made by expert crafts men and women in our US facility located in Fall River, Massachusetts.